When I began target shooting, your choices of a .22 pistol were not large. Oh, you could buy all kinds of plinkers, but a real tack-driver was hard to come by. Your choices were simple: Buy an S&W Model 41 or a High Standard Victor--or wait for someone who owned a Colt Match Woodsman to die and try to buy it off of his widow. Back in those days, the M41 listed at $250 and the Victor at $270. Adjusted for inflation, that comes to $780 and $850 respectively. Why those? Because they were accurate and reliable, and while in Bullseye you can get an alibi string if you have a malfunction, who wants the hassle and stress of doing it all over again? And in the other matches I shot you didn't get alibis, so you had to have reliability from the get-go. In 1984 the Victor went out of production--leaving the S&W and ferociously expensive Euro-plinkers as your .22 LR target-shooting choices. But you can't keep a good product down, and the High Standard Victor is back. The magazine catch is the gold latch on the bottom front of the frame. The magazines hold 10 rounds each. The button on the front of the frame lets you remove the barrel. While I've shot a bunch of them, I've never owned a Victor or other High Standard, so I didn't have an original on hand to compare to the test sample I received. But there was nothing about the new one to make it different from my recollections. The slide locks open if the magazine is empty. The magazine catch is at the bottom front of the frame. The barrel has the sight attached on a rib that protrudes back over the slide. On the front of the frame is a spring-loaded button. Push the button (it is quite stiff, and you'll need to use the edge of a table or shooting bench) and you release the barrel from the frame. Now release the slide stop and the slide comes forward off the frame. You're done taking it apart for cleaning, unless you feel the need to scrub under the grips. Unlike the magazine catch, which is where it is simply because it makes production easier (and no one needs to do a quick mag change in .22 LR competitions) the slide stop and safety are in useful locations. The safety is where all 1911 shooters want to find one: on the left side, above the grips. The slide stop is on the right, also above the grips. You can drop the slide on a fresh magazine by either pressing the catch down with your trigger finger or by pulling the slide back and letting go. The trigger comes from the factory set at 2.25 pounds, and is adjustable for weight and travel, not that I wasted any time fussing over it. The barrel rib holds the front and rear sight and is bolted on with screws threaded to the barrel. You can remove the iron sights and replace them with a scope base and put optics or a red-dot sight on top. You can also bolt extra weight to the bottom of the barrel, if the regular 46 ounces of the Victor is just too airy for you. An accurate, reliable .22 LR pistol is like milk and cookies: a comforting pleasure you need not feel guilty about. The Victor is like freshly baked chocolate-chip cookies, still warm, and a big glass of cold milk. You need not feel the least bit guilty about enjoying yourself. The slide stop is on the right side, convenient and simple. The safety is where 1911 shooters would expect it to be. And enjoy I did. I tried a box of each kind of .22 LR ammo I could find on my shelves. All were reliable, and none were less than very accurate. Some were scarily accurate. I'm used to gritting my teeth and working my way through a group, shooting five shots into something like two or three inches at 25 yards. With the Victor, I was able to regularly shoot one-inch groups of 10 shots at that same distance--over sandbags, of course. If I could shoot one-inch groups offhand I'd have long since hauled myself off to Camp Perry for some competitive gratification. The new pistols shoot very well indeed. As good as the old ones? Unless I can lay hands on 10 or 12 old ones, and do an exhaustive Ransom rest test (not happening anytime soon, I assure you) I can't say for sure. But this one sure is no slouch in the accuracy department. Nor in reliability. NOTES: Accuracy is the average of four five-shot groups fired from a sandbag benchrest at 25 yards. Velocity measured through a CED M2 chronograph placed 15 feet from the muzzle. 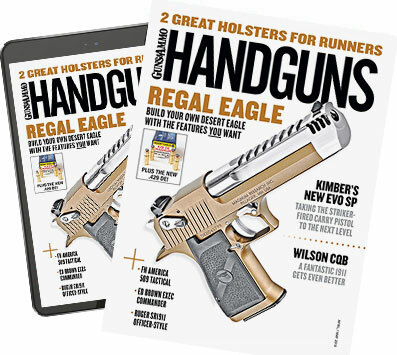 New magazines fit the old model High Standard pistols, a good thing as those who have older pistols have not had a source for new magazines until now. As an interesting extra, you can get a conversion kit for your Victor to switch it over to .22 Short. The barrel, slide and two magazines allow you to shoot those even-stubbier cartridges in international-style matches where Shorts are required. Why would you want a Victor? In a world where you can buy any number of plinker-grade .22 LR pistols for half the cost of a Victor or less, why spend more than what it costs to get the basics? Because you get more, that's why. You get more accuracy than you can shoot, more reliability than you can believe, a link to the past and incredible durability--a pistol that even if you won the lottery tomorrow you could not afford enough ammo to wear out. It's a pistol, like so many others that have been seen on the line at Camp Perry, you can leave to your heirs in your will. If that's not enough of a return on your hard-earned cash for you, then I don't know what to suggest.